BRAKE FAQ: Why does brake hardware wear out? Heating and cooling cycles can weaken brake hardware like springs and anti-rattle clips. Also, metal fatigue from flexing and movement can cause a piece of brake hardware to lose it’s spring. Weak hardware parts can result in excessive caliper/pad movement or binding causing noise and other related problems. This can lead to uneven and premature pad wear, rotor warpage and pulling. When rust and corrosion build up on a floating caliper’s slides or bushings, it can prevent the caliper from centering itself over the rotor when the brakes are applied. Not only does this reduce effective braking force and increase the vehicle’s stopping distance, it also causes uneven pad wear. The same condition may also create uneven braking between the right and left calipers, causing the brakes to pull toward the stronger side. Even if a piece of brake hardware looks brand new, it should be replaced when the pads are replaced. 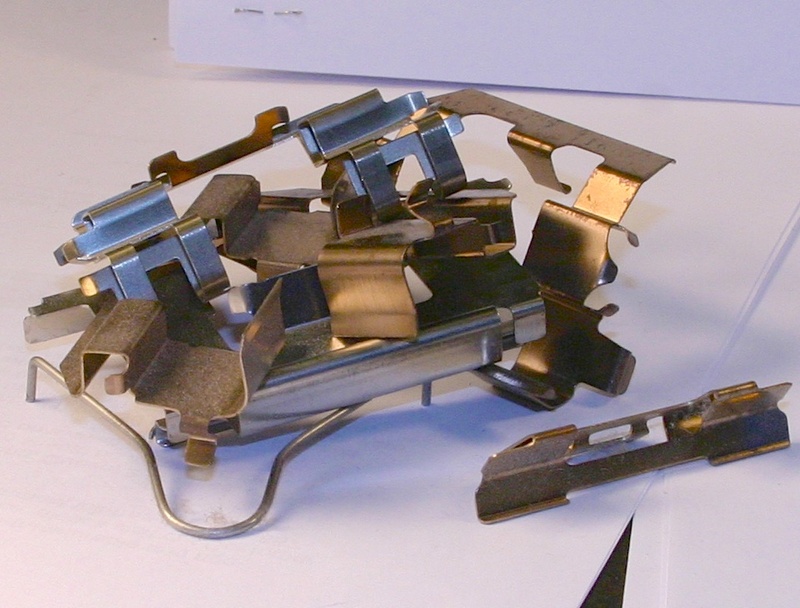 Metal fatigue and heat can cause unseen damage that could cause the pads to wear prematurely. A few dollars spent on hardware can save a few hundred dollars in repairs and downtime later. When technicians think of brake hardware they think springs, clips and slides. But, soft parts like dustshields, grommets and bushings need just as much attention. Ozone, heat and debris can destroy rubber parts. Always inspect and replace if necessary any dust boots or grommets that protect caliper bolts or slides. If the soft parts look OK, clean out all the old lubricant and replace with new lubricant. Unlike steel, soft parts like rubber are sensitive to chemicals in lubricants. Brake hardware for disc brakes is not a dealer-only item. Your local parts store might carry three lines of hardware. This product category is more than shims, anti-rattle clips or dust shields. Many of these lines of products include items like caliper brackets, slides and all the soft parts to restore the system to like-new condition. Also, premium brake pads are including the necessary hardware as part of the brake pad kit. This entry was posted in Braking FAQ by Calvin. Bookmark the permalink.